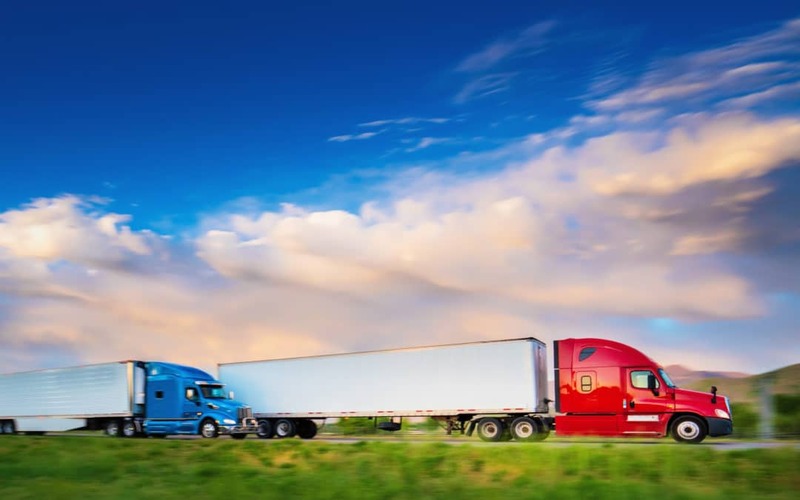 As people who ship or transport freight know, there are two primary types of suspension for semi trailers: spring ride and air ride. Spring ride uses multiple layers of flexible steel strips joined together in what is called a “leaf pack” to provide cushioning for the trailer. Air ride, the more recent of the two technologies, uses a system of air lines, valves, and air-spring bags to raise the trailer chassis from the axle. Following the introduction of air ride technology 20 years ago, the prevailing wisdom became that if your cargo was at all at risk of being damaged in transit, you had to choose air ride suspension for your semi trailers. In fact, many companies began phasing out their spring ride rigs in favor of air ride strictly because of “best practices” that were based solely on opinions rather than facts. More recently, however, stakeholders from shipping companies to rental trailer providers have started to take a fresh look at the two types of suspension. And, now they are using science rather than hearsay to inform the air ride vs. spring ride debate. Nobody who knows semi trailers would suggest that you should never use an air ride rig. For certain kinds of shipments, air ride is crucial. But, the belief that you should always use a semi trailer with air ride suspension is now being called out as incorrect as well. The difference is significant even if you are only running one trailer. For companies operating 10 or 50 or 200 trailers, you can see how the total can take a big bite out of their bottom line. So, these organizations are realizing that even if they have to pay the occasional damage claim (see more about ride quality below), they are still coming out ahead financially. And the money they save can be reinvested to help the company grow. Plus, those are just the maintenance costs. Air ride trailers are also more expense to purchase, lease, or rent, so there is further financial incentive to revisit the air/spring decision. People are also starting to question the belief that air suspension provides a dramatically smoother ride. In fact, one of the country’s largest truckload and logistics providers decided to do some testing of air ride and spring ride suspension systems to see how well they protected the integrity of freight loads. They conducted a series of acceleration and vibration trials to measure g-forces as an indicator of ride quality and smoothness. Loads of 10,000, 30,000, and 40,000 pounds and industry-standard spring ride and air ride suspensions were used. When looking at ride quality at the front of the trailer, testing revealed that the smoothness of the ride was related to the tractor suspension, not the trailer suspension, meaning it didn’t matter if the trailer had air ride or spring ride suspension. Regarding ride quality at the back of the trailer, results showed that air ride suspension provided only slightly better ride quality overall, and that under most circumstances, spring ride provided better ride quality. In other words, companies that disregard the financial results because “Cost is no object. We want the best ride for our shipments or our customers’ shipments,” now have even more to think about. The studies referred to above are, of course, just two data points. It’s certainly possible that there are others that have been conducted that show less of a difference in maintenance cost and more of a disparity in ride quality between spring ride and air ride suspension. From our perspective, the key is keeping an open mind about what’s best for your company and your customers. This is especially important today, since advances in everything from the way cargo is packed to the way loads are secured have reduced the potential for damage. Still, in some cases the right choice for a shipment is going to be air ride. However, in many others, the “prevailing wisdom” mentioned earlier probably should not prevail. Even the anecdotal evidence points to the effectiveness of spring ride suspension. For example, many large carriers, who have plenty of data to evaluate and much on the line if they disappoint customers, are switching to spring ride. And finally, a common sense argument can be made for using spring ride for most types of shipments. As one company observed, it seems a little odd that we trust shipments will survive being bounced around on the ocean in a cargo freighter or rattled over long distances on a train but somehow are convinced that the typically shorter haul in a semi is going to result in significant damage. Is a spring ride trailer right for your company and your customer? The best way to find out is to give your trailer provider a call and tell them about your needs. What are you transporting? In what quantity? Where are you picking up and dropping off? Have you transported similar loads before? If so, what were the results? At Boxwheel, we offer both spring ride and air ride trailers. If the details you provide point to air ride, we’ll surely steer you in that direction. We want your trips to be uneventful and free of cargo damage just like you do. But if spring ride suspension will give you all the cargo protection you need more affordably, we’ll encourage you to go that route. If you have questions about renting, leasing, or buying semi trailers from Boxwheel, we’re happy to answer them. Contact us at your convenience and we can tell you about our inventory, our industry-leading service, and our reputation for making it affordable, safe, and easy to get on the road with the right equipment. Should You Rent a Semi Trailer, Lease a Semi Trailer, or Buy a Semi Trailer?